The definition of Spiritual bypassing is to use spiritual terms to avoid the ‘mess’ of everyday life. Common examples are exaggerated detachment, emotional numbing, anger phobia and overemphasis on the positive. (Very prevalent in the spiritual social media world). When I lived in Thailand at a Tantra university I was guilty of Spiritual bypassing. I focused a lot on building energy into my heart chakra for two years and then believed myself to be so much in ‘anahata’ (the heart chakra) that I was far too loving to get angry. In reality, I was scared of the emotion of anger and was using a spiritual belief to avoid dealing with emotions from the past that I had never integrated. If you keep shoving anything down in the dark for long enough its roar becomes louder, which is what eventually happened. One of my teachers, Sarah Powers, talks about, not just waking up (reaching higher states of consciousness), but also growing up, (integrating and holding our emotions) and growing out (meeting ourselves with compassion so we can then share it with others). The moment I sit or stand on my mat I drop into moment to moment, non-judgmental, loving awareness. I check in with my body, with my emotions and then my mind. I try to see what is going on inside, (interoception) and by doing this frequently, in a loving way, it helps to regulate my emotions better. In our daily lives when an emotion comes up it is easy to be consumed by it and act from that emotional place. The more we practice mindfulness the more we can start to see what is going on in our inner landscape and choose how we respond to life. A choice is a spontaneous response, a reaction is usually a subconscious decision taken from outside our conscious control. (Think someone saying angry words that they regret after). Therefore, mindfulness practice is giving us more choices to respond to the ups and downs of life in a skilful way. It is teaching us to un-blend from the emotion, not to sit on it but to sit with the emotion in a loving way. Have there ever been so many distractions over the course of humanity as now? I think not! Whether it is the TV, e-mails, Facebook or Instagram our attention spans are reportedly getting shorter and shorter. After the initial mindfulness of body, heart and mind I check in with the breath. At first, to notice the breath, is it soft or heavy? Loud or quiet? More in the left nostril or right nostril? More in the belly or chest? Everytime the mind wanders I bring it back to feeling the breath, without controlling the breath. This is starting to train the brain to focus on what we want to let go of. To attend to what we intend. This practice is literally building up the decision making part of the brain to help us not get so caught up in content but to choose which content is beneficial. Through practice it is easier to be present with our loved ones when we are at home. Instead of the planning mind sneaking in and getting caught up in thoughts of work we can let these thoughts go and give our entire attention to our loved ones. A rare and valuable gift! 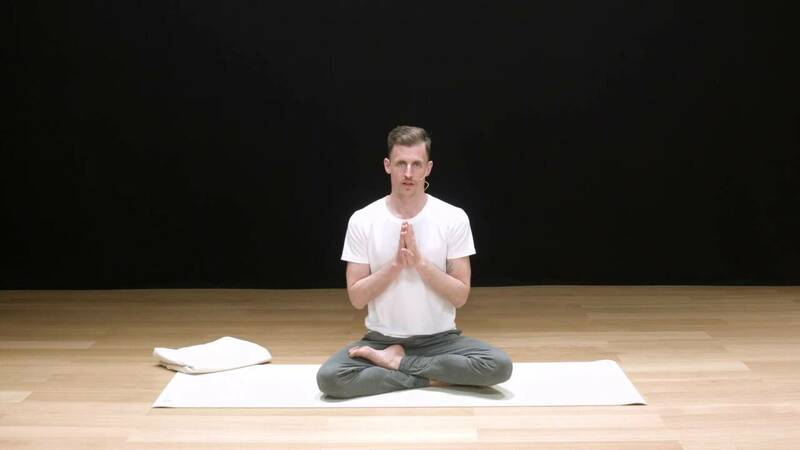 After this breath focus, I drop the awareness to the lower belly, and start to breath diaphragmatically, with an ujjayi breath, to a ratio of 5 in 5 out. By breathing diaphragmatically the abdominal organs and the vagus nerve (a nerve that runs through all the organs) get massaged and therefore the body moves into the ‘rest and digest’ branch of the nervous system and out the ‘fight of flight’ branch. In the rest and digest branch, the heart rate lower, blood pressure lowers, the immune system is boosted and digestion can occur. The breathing rhythm 5 in 5 out is also an optimum rhythm to relax the body and give the best fuel to the brain. From a more energetic point of view by dropping the awareness to the lower belly, we drop into the ‘hara’ - a place of ‘being’ not doing, a place where our intuition and natural intelligence can arise. Look at any new born of any species and they come into the world with so much playfulness and curiosity, which as adults we sometimes forget and become far too serious. One fascinating study on bears showed that the bears who played the most lived the longest, which is a good enough reason for me. However, a posture can never be truly known. Each day is different, each moment and even each breath! In each posture we can cultivate a curiosity for what is alive right now. Physically am I stiffer on one side or the other in a posture? Does my mind wander in some postures more than others? What emotions or thoughts come up in each posture? Each posture is a wonderful frame for you to dive in and investigate what is happening here and now. These are some examples of tools I use to cultivate certain qualities in my life, as first you make habits then habits make you. To play is such a privilege as it means we are feeling safe, so if we feel safe enough in our practice how can we bring more curiosity and play into each moment? The ego likes to put things in a box, to think it knows something, so that it can put its attention elsewhere. An example of this would be childs pose, the mind thinks it knows this posture, so it wonders off to plan tomorrow. Here are some questions I encourage you to have in mind the next time you go to class or step on your mat; What do I want to cultivate more of in my life? Is this practice helping me to get there? How can I use this very moment to begin? In this class we integrate a connection to the koshas into the asana practice, guided by Mona Anand. Explore your ability to move in variated movement patterns. A beautiful meditation to help us relate to the people around us. Lukes teaching is a combination of hatha, vinyasa, yin, neuroscience, concepts from psychotherapy, Buddhist teachings, tantra, yoga therapy and Qi Gong. The way he teaches is how to meet every moment on the mat in a way that we would like to meet every moment off it.